Selected from 20,000 images of which 102 were awarded, I am delighted to let you know that my image “Sleeping Polar Bear” has been highly commended in the Polar Passion category in Nature’s Best Photography 2014. This annual competition, known as the Nature’s Best Windland Smith Rice International Photography Contest, is hosted by Nature’s Best Photography Magazine based in Washington, D.C. and is one of the largest international nature photography competitions. It is open for both amatuers and professional photographers world wide, and this year photographers from 50 countries – in all 20,000 images – entered the competition. 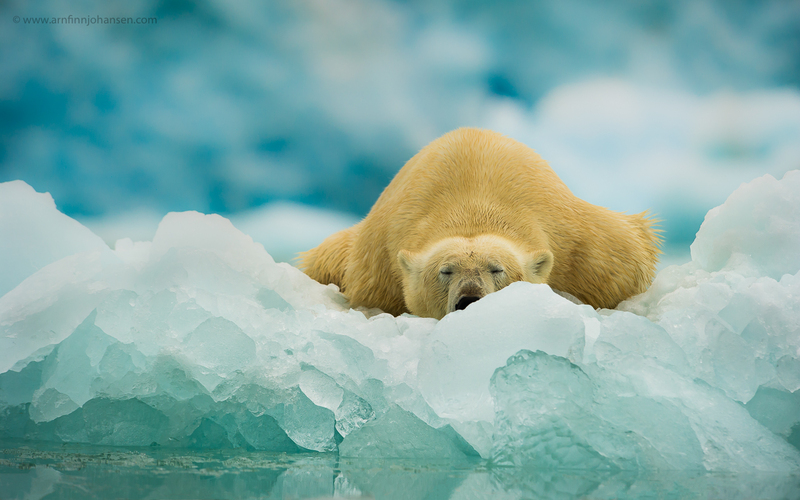 The image of the sleeping Polar Bear is taken on Svalbard in Lilliehööksfjorden a few years ago. Thanks to Ole Jørgen Liodden and WildPhoto Travel for a great trip! I also like to emphasize two other Norwegian photographers and friends; Audun Rikardsen winning this year’s Nature’s Best Grand Prize, and Tom Schandy who also was rewarded a Highly Commended. Please click on the image to enlarge and see it 1400px quality. Highly Commended photograph in Nature´s Best Photography 2014. Nikon D3s, Nikkor 400/2.8 VR, 1/500 sec at f/4.5. ISO 1000. Superb image communicating an intimate moment of Polar bear’s life. Fantastic! You are just doing great Arnfinn. Well done. Happy New year as well!! Congrats buddy. Absolute fantastisc foto. Hope you will continue to take great wildlife pictures in years to come. Congratulations ! That\’s one way to kick of a new year ! I must say that such Polar Bear pictures are your signature shots. You did it again, Arnfinn! Congratulation! Happy New Year too…. Another well deserved achievement for a dedicated photographer well done Arnfinn..